That big ?King Moon? is here and the tides are wickedly high once again as they were with the last one , the ?Blood Moon?. Seems everything has a name now days. Strong bite on the reefs and around near shore wrecks as the Kings are biting well. Some Mahi as you can see as well. Full moon, early morning high tide pushing good water up on to the reefs has been best and it has been a very steady and good bite. 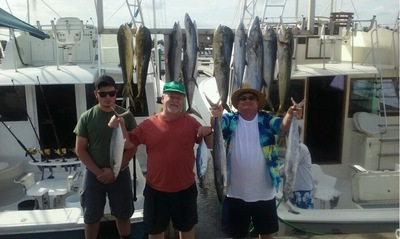 A couple of Wahoo chances but one got us at the boat and another bit us off early into the fight. A few more Sails biting with this wind and ours have been in 90 to 130 feet of water, regardless of water clarity or current speed. That wind has arrived as predicted and continues to blow a bit, but it is far down from what it had been blowing initially with this system. With the big full moon and morning high tides we have elected to stay near shore and everything for us has been within 250 feet of water. A few quick looks out to 600 have really held nothing for us and we return to the reefs to take advantage of the good bite. Mahi have been all the way inside and up on the inside reef in 40 to 60 feet chasing bait and that is always a nice surprise to find them there. We haven’t seen the Sails in there yet but it is going to happen. Lots off bally-Hoo right now. We will see large fish in there more and more now as the Bally-Hoo move into the shallower water, but a bit deeper seems to remain the best as one would expect. This is a fun time of year to fish here. Some days will be difficult and others will be memorable what with the changing conditions associated with the weather and the frontal systems not to mention the transition to finding the fall bait schools and migratory fish and their availability. Don’t be afraid of that moon and hunker down for those windy days, the fish love it.